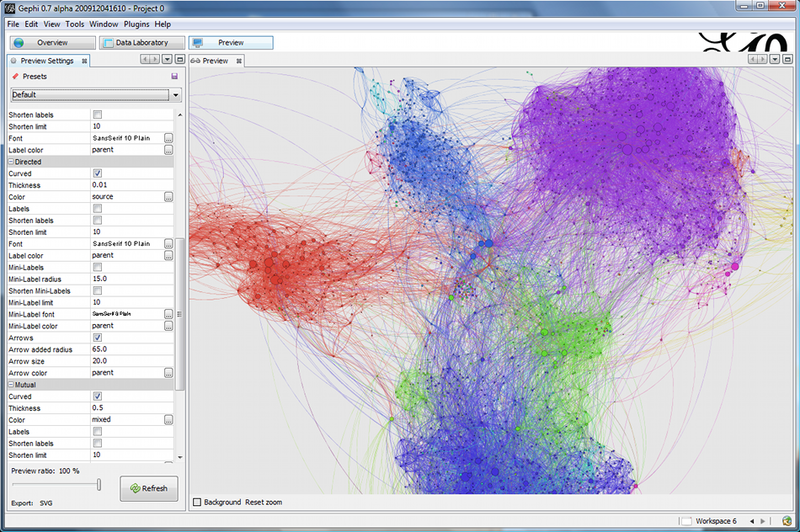 Gephi is a visual tool to manipulate and analyze graphs. Gephi is an Open Source project. Take a look at the amazing features. the Streaming plugin that calls OrientDB server via HTTP. OrientDB exposes the new "/gephi" command in HTTP GET method that executes a query and returns the result set in "gephi" format. In this mini guide we will take a look at the first one: the streaming plugin. Before to start assure you&apos;ve OrientDB 1.1.0-SNAPSHOT or greater. Before to import a graph assure a OrientDB server instance is running somewhere. For more information watch this video. host is the host name or the ip address where the OrientDB server is running. If you&apos;re executing OrientDB on the same machine where Gephi is running use "localhost"
port is the port number where the OrientDB server is running. By default is 2480. To use the OrientDB&apos;s SQL language use sql as language. For more information look at the SQL-Syntax. To use the powerful GREMLIN language to retrieve the graph or a portion of it use gremlin as language. For more information look at the GREMLIN syntax.